Knitter’s Pride Nova Platina are made from hollow brass pipes which have been plated with chrome. This provides a shiny smooth surface that allows stitches to move freely and quickly. 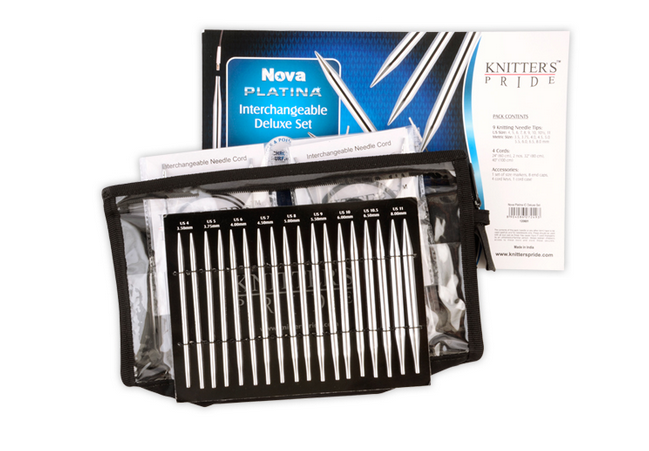 The tips of the Platina needles are pointier with longer tapered tips suitable for all projects including lace.The Knitter’s Pride Nova Platina needles are light in weight, durable and comfortable to the hand. The needle tips in this set measure 4 1/2 inches without the cord attached. - Sharp, long tapered points. - Smooth joins with an easy-to-connect, flexible cord. - Slick needles that allow yarns to glide easily. - 9 pairs of interchangeable needles. - US Sizes 4, 5, 6, 7, 8, 9, 10, 10.5, and 11 / Metric Sizes 3.5, 3.75, 4, 4.5, 5, 5.5, 6, 6.5, and 8 mm. - 4 cords to make sizes: 24" (60 cm), 40" (100 cm) and two cords for 32" (80 cm). - 1 set of size markers, 8 end caps, 4 cord keys, and 1 cord case. - Packed in a clear vinyl case.